After a serious test of patience, allowing three weeks for carbonating and then an additional week of cold conditioning in the fridge, I finally tasted the brown ale I brewed back in January. Being my first brew day, it was marked by mistakes. I’m still learning about things I did wrong that day. In all the mash temps were poorly controlled during the partial mash, water was not allowed to freely flow through the grain bag, I may have precipitated DMS into the wort, and my sanitation practices were not great (partly because I sliced open my thumb). I never got an OG reading, but the FG was 1.014. Fermentation mostly occurred in between 68 and 72 degrees F using Wyeast 1968 London ESB. I used a kit from Brooklyn Homebrew to brew it. Nonetheless, the result was mostly definitely beer. And beer that is not bad, in fact. Last night I shared it with my roommates and Colleen’s sister, Kate (who has been behind the scenes of some cool reads like The Little Book of Heartbreak and Why Does Batman Carry Shark Repellant?). I also lied about being patient – in fact I also shared it with my brother the night before, and a week before that all of us in the apartment had some along with our friend Brendan Edward Kennedy (an amazing poet, singer, actor, comedian – he’s the one with the moneybags, and person). So what did we all think? Appearance: A pleasant head can be achieved with a relatively hard pour, but there is almost no retention, the head dissipating within a minute or two leaving a very thin layer of small bubbles on the surface. There is absolutely no lacing either. The color is a sort of dull copper. The beer cleared well, and any yeast that makes it into the glass simply flocculates at the bottom. Aroma: Slightly boozy, but no strong malt or hop character. Smells a bit like my memory of a Newcastle, though I don’t drink them often so I could be off. The scent is relatively thin and faint. Flavor: Given the pound of caramel malt that went into this brew, I’m surprised it doesn’t have a sweeter character, but the beer seems surprisingly well balanced. The carbonation brings out the bitterness, but it is slight. There isn’t an overbearing maltiness to the beer either. The alcohol, malt, and hops all seem in harmony, but altogether muted. The beer is ultimately best characterized as “agreeable” and “easy to drink”. Mouthfeel: Light, but not watery. The carbonation is probably the best part, slightly stinging and accentuating the bitterness of the beer. This is a pretty dry drinking beer, leaving no stickiness after it’s gone. Conclusion: I am just as happy drinking this as a Newcastle, although I’ve never been inspired by Newcastle. I’d probably fork over $7 or $8 for a six-pack of this, knowing I’d get something that I’d enjoy but not fall in love with. The beer has a refreshing quality, with some presence of flavor but nothing overbearing or bold. It could possibly make a good summer beer. However, the next time I brew a brown ale, it will probably be quite different from this one. 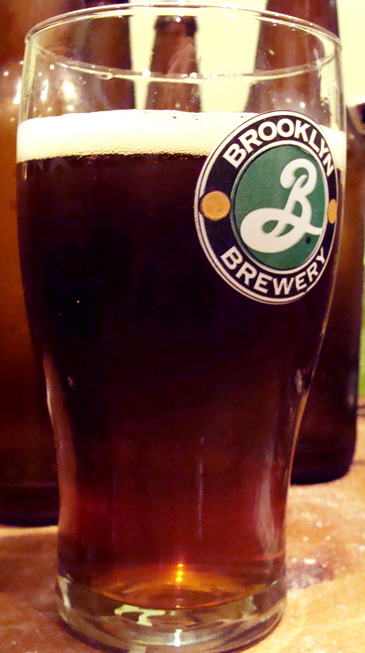 This entry was posted in tasting and tagged brown ale, first brew on February 24, 2013 by Dylan Bargteil.